Planning a celebration for your beautiful little boy? These blue cupcake treat bags make favours full of fun for baby showers, christenings, new baby boy & 1st birthday celebrations. The room will be filled with sweet smiles and good wishes when your guests see these dessert-inspired favours filled with your favourite treats and treasures. Fashioncraft baked up the idea for these versatile little-boy-themed favours with your creativity in mind. So, we hope you have as much fun filling them as we did making them! 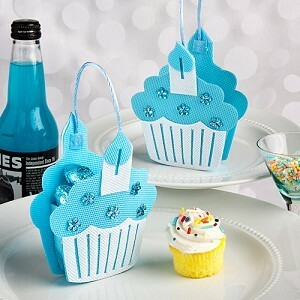 	Each measures 3.5" x 4.5"
	Delectable blue frosted cupcake shaped bag is made of cloth with a blue satin string handle on top and a Velcro closure. 	Ready to be filled with yummy treats of your choice.